NOTE: Applications for this award have now closed. The Merck-AGITG Kristian Anderson Award supports a clinician undertaking a higher degree (MD or Ph.D) researching an aspect of personalised medicine in the area of gastro-intestinal cancer. The award will provide one year’s funding at an equivalent level to NHMRC support for a higher degree ($36,700). This would be the first year of a planned three-year project – the grant aims to allow the clinician to be more competitive for funding agency support in later years. Applications for this award have now closed. The award recipient will be announced at the 20th AGITG Annual Scientific Meeting Dinner on 1 November 2018. The recipient will be required to present on the status of the project at a future AGITG Annual Scientific Meeting. The Merck-AGITG Kristian Anderson Award is supported by an untied grant from Merck. Kristian Anderson (1975-2012) was diagnosed with cancer in his bowel and liver in October 2009, at age 34. He gained international attention in 2010 as a result of a video he filmed for his wife’s birthday. The touching clip thanked her for her support in his illness, and featured then New Zealand Prime Minister John Key and movie star Hugh Jackman. Anderson was interviewed on the Oprah Winfrey show alongside his wife, where he used his platform to raise public awareness of bowel cancer. 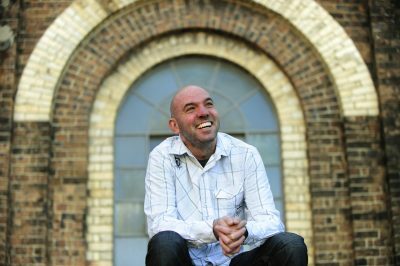 After his life was prolonged by cetuximab, a drug used in the treatment of advanced colon cancer, Kristian used his profile to successfully lobby the federal government to subsidise it to extend availability. After two years of extensive treatment, he passed away on 2 January 2012. He is survived by his wife Rachel and sons Cody and Jakob. Kristian has also left behind a legacy as the man who secured federal funding for cetuximab, which has improved the treatment of many colon cancer patients. “It is fitting that we have launched an award in honour of a man who fought so hard to find better and more affordable treatments for people with bowel cancer,” says Associate Professor Tim Price, Chair of the AGITG. “Australia has one of the highest incidences of bowel cancer in the world and it is vital that we encourage young researchers to continue to develop better-targeted treatments for this disease.